Armadillo Aerospace was an aerospace startup company based in Mesquite, Texas. Its initial goal was to build a crewed suborbital spacecraft capable of space tourism, and it had also stated long-term ambitions of orbital spaceflight. The company was founded by John Carmack. On October 24, 2008, Armadillo won $350,000 by succeeding in the Level 1 Northrop Grumman Lunar Lander Challenge. On September 12, 2009, Armadillo won $500,000 by succeeding in Level 2 of the same challenge. In 2010, they signed an exclusive deal with Space Adventures. Armadillo Aerospace was to provide a sub-orbital rocket to fly tourists into space, while Space Adventures would sell tickets for the experience. In August 2013, Carmack announced that Armadillo Aerospace had been put in "hibernation mode", following setbacks including the crash of the STIG-B rocket in January 2013. In May 2014, several former employees of Armadillo Aerospace formed a new company, Exos Aerospace, which was created to carry their former company's research into reusable commercial space craft. The new company set up their operations in one of Armadillo's former facilities at the Caddo Mills Municipal Airport, in Texas. Exos completed acquisition of Armadillo assets in early 2015, and intended to begin launches of the Suborbital Active Rocket with Guidance (SARGE) in 2016 from Spaceport America in New Mexico. [needs update] SARGE will be an enhanced Armadillo STIG-B. In September 2017, John Carmack retweeted a post about SpaceX rocket bloopers, along with his post "I showed all of our crashes at the beginning of Armadillo Aerospace, but everyone thought it was a terrible idea and talked me out of it." In the comment section, one person asked if there's chance of comeback for Armadillo Aerospace. He subsequently replied that there is the chance that he might "want to try at some point" with his own scheme, giving a sign that Armadillo Aerospace could someday return from hibernation mode. Captive test flight of Armadillo Aerospace's Pixel rocket before the 2006 X-Prize Cup. The company placed a strong emphasis on a rapid build and test cycle. Armadillo Aerospace designed and built more than 12 vehicles which used about 50 engine designs for over 100 rocket flights. Each design had several features in common. One was the use of modern computer technologies and electronics to simplify rocket control and reduce development costs. Another was the use of liquid propellants and VTVL to facilitate short launch-to-launch times. The company was a competitor for the Ansari X-Prize. Armadillo's X-Prize vehicle was unorthodox among modern rockets in that instead of using stabilization fins, which complicate the design and increase drag, Armadillo used an aerodynamically unstable design, where the computer controlled jet vanes based on feedback from fibre optic gyroscopes. Armadillo stated a preference for simplicity and reliability over performance, which was evident in its choice[when?] of hydrogen peroxide (50% concentration in water) and methanol as a mixed monopropellant for the vehicle. A monopropellant-based engine requires only a single tank, as well as greatly simplified plumbing and other hardware. Armadillo Aerospace competed in the 2006 X PRIZE Cup. Armadillo Aerospace was the only competitor in the Lunar Lander Challenge. The company took two similar vehicles, Pixel and Texel, to the event. The vehicles narrowly failed to win the Level 1 prize, after making three dramatic attempts totalling over 5 minutes in the air, finally crashing out on the final attempt. Persistent landing problems were the main cause of failure, with the undercarriage breaking several times, and landing slightly off the pad on one occasion due to guidance difficulties. These flights were a highlight of the Wirefly X-prize cup. The quad vehicle design is pressure-fed in blow down mode from an initial pressure of 320 psi for level 1 (400 psi level 2). The roll thrusters are cross-fed by gas drawn from ullage space of the opposite tank. The vehicle is able to transfer propellant through connecting pipes between opposite tanks by controlling ullage pressures with the thrusters; this helps it balance, minimizing gas use. The main engine has two-axis thrust vectoring. The vehicle is fully computer controlled; with guidance from GPS and fiber optic gyroscopes. Armadillo Aerospace competed in the 2007 Lunar Lander Challenge event in the Wirefly X-Prize Cup 2007. In the level 1 events, Armadillo's craft MOD (actually, module #1) logged several attempts, including several successful first leg flights, but was unable to complete the return trip during any attempt. On its first attempt, a clogged igniter orifice prevented ignition. On the second attempt, the first leg flight was perfect; increased guidance and control capabilities allowed the module to, in Carmack's words, 'burn the X-mark off the target pad'. The return leg was delayed slightly, because the igniter had clogged again. When the second leg was attempted, a 'hard start' cracked the graphite combustion chamber. As the vehicle was still flying, Carmack flew the crippled vehicle through the course as quickly as possible and hovered 2–3 meters above the landing pad. With only a few seconds remaining in the required flight time, the damaged combustion chamber cracked again, which caused the vehicle to tilt enough to trigger a computer abort. The vehicle performed an auto-land, but the tilt caused the module to tip over on landing after only 82 seconds in the air. The second attempt began with another perfect first leg, but the return was marred by another hard start. Seeing that the engine was badly damaged (although flying), the team commanded an abort. The module landed back on the pad after only a few seconds. On the final attempt, MOD suffered a violent "hard start", resulting in engine explosion. The violence of the explosion embedded a piece of the graphite chamber in the ground 64 meters from the launch pad, and ended their attempts in 2007 for the prize. The 2008 Lunar Lander Challenge took place October 24–25 at the Las Cruces International Airport in New Mexico. Armadillo Aerospace competed for the third year but for the first time had competition, from the TrueZer0 team. Both received waivers from the FAA to fly experimental rockets. TrueZero attempted level 1, achieved hover, then lost roll control and was aborted and crashed. Armadillo had an unsuccessful first attempt at level 1, and landed early due to inadequate thrust. On their second attempt they completed the first leg, but the second leg was cut short by the FAA closing the flight window. The second leg was held in the afternoon, and they were able to take the Level 1 top prize of $350,000. Armadillo's attempt at the level 2 prize on October 25 was aborted due to their vehicle toppling over after the engine casing burned through due to a fuel-line problem. Armadillo attempted the Level 2 prize on September 12, 2009. Armadillo successfully flew both legs with their Mod vehicle, each flight lasting over 180 seconds, landing safely. However their landing accuracy was not sufficient to win the first prize, instead they won the US$500,000 second prize while Masten Space Systems' Xoie lander won the US$1,000,000 Level 2 first prize. In 2008, the Rocket Racing League announced that Armadillo Aerospace engines would be used in a second generation of X-Racer aircraft. As of March 2010[update], the Rocket Racing League was utilizing a highly modified Velocity XL FG airframe and an Armadillo Aerospace 2,500 pound thrust liquid oxygen (LOX) and ethanol rocket engine in both the Mark-II X-Racer and Mark-III X-Racer demonstration vehicles. The Rocket Racing league never got out of its early development mode, and no racing season was ever held. The Super Mod reusable launch vehicle is a vertical-takeoff, vertical-landing (VTVL) uncrewed rocket which was developed by Armadillo in 2010-2011. It was submitted to NASA as a potential suborbital vehicle for use as a suborbital reusable launch vehicle (sRLV) under NASA's Flight Opportunities Program. It added aerodynamic fairings, partially extendable landing legs with lower aerodynamic drag, and systems improvements to the basic Mod vehicle structure and systems. In late 2010, Armadillo started development of a new, longer rocket design created for lower-drag, higher-speed high-altitude flights, which they named Stig in homage of the Top Gear driver The Stig. This rocket had similar systems, motors, and component weights as the Super Mod vehicles, but was aerodynamically optimized for high-altitude flights with long 15 inches (38 cm) diameter cylindrical tanks instead of larger spherical tanks. The second flight, which took place in 2012, reached 50 miles (82 kilometers), but the recovery chute did not work as planned. The third flight took place in January 2013 and the vehicle experienced a hard landing following a parachute failure-to-deploy, though the launch was good. In February 2006, Carmack stated that the program to date had cost slightly over $2 million. Even by the standards of X-Prize candidates, this is a low budget. Scaled Composites is estimated to have spent $25 million on its SpaceShipOne development program. In April 2008, Carmack offered an updated figure of "total cost to date, about $3.5 million". He estimated that another $2 million would be needed to achieve a crewed flight to 100 km using Armadillo's modular design in a "six-pack" configuration. By 2010, Armadillo had 7 full-time employees, and was profitable on ongoing operations (though Carmack was continuing to invest in development efforts). The company mascot was an armadillo named Widget. In August 2013, Carmack indicated that following the crash of the STIG-B rocket earlier that year, he had wound down the company operations and had put the company in "hibernation mode." Armadillo had stopped accepting (profitable) contract R&D work two years prior, in order to focus on development of a suborbital reusable rocket. During those two years, Armadillo operated at an approximately US$1 million per year burn rate funded personally by Carmack. Several reasons were offered for this outcome, including a failure to adopt a multi-test-vehicle build strategy, making the loss of a single rocket more significant than it would have otherwise been. As of August 2013[update], Carmack was "actively looking for outside investors to restart work on the company’s rockets". 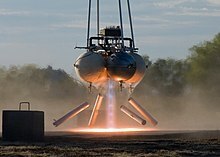 In 2015 the assets of Armadillo Aerospace were sold to EXOS Aerospace Systems & Technologies, Inc.
Carmack stated in his monthly reports and in forum posts that he expected his path to an orbital vehicle to include modular rockets similar to OTRAG technology. Lutz Kayser, the founding engineer of OTRAG, visited Armadillo in May 2006 and loaned Carmack some of their original research hardware. The U.S. Armadillo Aerospace company, which is developing the suborbital spaceship for space tourist flights, announced on Monday that a Russian has become its first confirmed passenger. St Petersburg resident Evgeny Kovalev won his ticket to the cosmos in a contest organized by Efes brewery. ^ a b Foust, Jeff (May 11, 2015). "Exos Seeks To Revive Armadillo Rocket Technology". Space News. Retrieved November 2, 2017. ^ a b Michaels, Patrick (September 14, 2009). "Rocket Men From Mesquite's Armadillo Aerospace Are in Line For $1 Million X Prize". Dallas Observer. Retrieved September 14, 2009. ^ a b "International Space Fellowship". spacefellowship.com. Retrieved August 11, 2017. ^ Perhaps You'll Visit Space In Your Lifetime, After All, Gizmodo, 2010-05-12, accessed May 15, 2010. ^ "Space Tourism Firm to Offer Suborbital Joy Rides at Lower Costs". Retrieved September 28, 2016. ^ a b c d Foust, Jeff (August 1, 2013). "Carmack: Armadillo Aerospace in "hibernation mode"". NewSpace Journal. Retrieved August 6, 2013. ^ Armadillo Aerospace Vets Start New Space Company 2014-05-19 - Space News reports new company formed by former Armadillo employees. ^ Foust, Jeff (May 11, 2015). "Exos Seeks To Revive Armadillo Rocket Technology". Space News. Retrieved May 12, 2015. ^ Carmack, John (September 14, 2017). "I showed all of our crashes at the beginning of Armadillo Aerospace, but everyone thought it was a terrible idea and talked me out of it". @ID_AA_Carmack. Retrieved November 15, 2017. ^ "Armadillo Aerospace: Scaling Up for Modularized Spaceships". Retrieved September 28, 2016. ^ Carmack, John. "Armadillo Aerospace News Archive". Archived from the original on December 17, 2007. ^ David, Leonard (October 28, 2007). "Armadillo Setback As Vehicle Flames Out". livescience.com. ^ "Armadillo rocket takes $350,000 prize". MSNBC. October 24, 2008. Archived from the original on October 28, 2008. Retrieved October 25, 2008. ^ "Masten and Armadillo Claim Lunar Lander Prizes". Centennial Challenges: NASA's Prize Program for the "Citizen Inventor". NASA. November 2, 2009. Retrieved March 10, 2011. 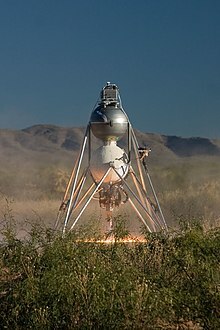 With only a few days remaining in the 2009 competition period, Masten Space Systems of Mojave, California successfully met the Level Two requirements for the Centennial Challenges — Lunar Lander Challenge and by posting the best average landing accuracy, won the first place prize of $1,000,000. The flights were conducted with their “Xoie” (XA-0.1E) vehicle on Oct. 30 at the Mojave Air and Space Port. Armadillo Aerospace, the long-time leader in Lunar Lander Challenge efforts, was the first team to qualify for the Level Two prize with successful flights on Sept. 12 in Caddo Mills, Texas. The average landing accuracy determines which teams will receive first and second place prizes. The average accuracy for Armadillo Aerospace flights was 87 cm. but the Masten team achieved an accuracy of 19 cm, moving them into first place. Armadillo Aerospace will receive the $500,000 second place prize. ^ Rocket Racing League Announces Milestone Development in X-Racer Archived July 15, 2011, at the Wayback Machine, press release, 2010-03-10, accessed May 3, 2010. ^ "Private Rocket Launch Tests Supersonic Parachute". Retrieved August 11, 2017. ^ STIG B-III mission, January 5, 2013 Archived May 3, 2013, at the Wayback Machine. Armadillo Aerospace. ^ "RLV and Space Transport News » Alt.space spending". Archived from the original on May 24, 2012. Retrieved August 11, 2017. ^ Sputnik. "U.S. suborbital spaceship signs up Russian space tourist". en.rian.ru. Retrieved August 11, 2017. This page was last edited on 13 March 2019, at 04:31 (UTC).